Here is a picture of Minister Louis Farrakhan as he landed in Haiti for his visit. The Muslim religious leader wants to learn about Haitian Voodoo. 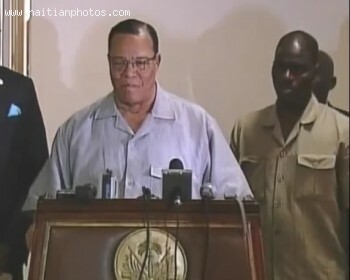 Farrakhan told the people at a news conference at Toussaint L'Ouverture Airport in Haiti that he already know about Christianity, he already know about Muslim. He said that he doesn't know Voodoo. The Reverent also stated that there is no way that Haiti can comeback to it original position if we disrespect Voodoo and those who gave Haiti liberty.